College! It’s one of the most amazing experiences life has to offer. But what actually happens there? How do you make the most of four transforming years? What should you expect? And what the heck is a roommate? This book answers the most pressing questions that college-bound high school graduates probably never think to ask. Like: Why should I get to my dorm room early on Day 1? Or is it really a bad idea if I major in archaeology? And how does one use a “washing machine”? 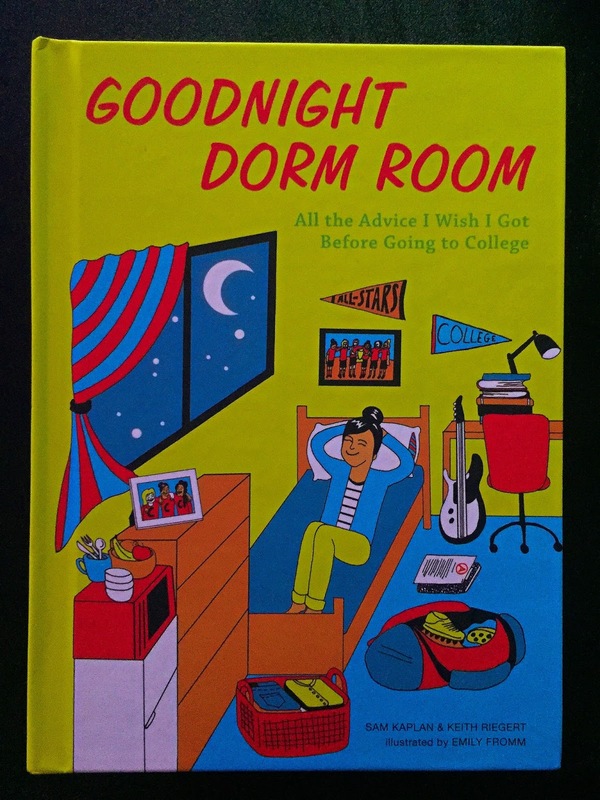 Fully illustrated by talented San Francisco-based artist, Emily Fromm, this book has all the advice and information that every college grad wishes they had gotten before freshman year started. High School Graduation means a ton of changes this year for many who are starting the new path of independence. College means the first time being away from home, taking care of so many important things as well as making sure you are taking care of yourself. While you are doing all of that you also need to attend class and do your very best because hey you are paying for it! It is a serious time in a young adult's life and that is why I love this book. Good Night Dorm is pretty much a take on Goodnight Moon in it's rhyming prose with cute illustrations and words that take you from high school graduation day to the end of your 4 years of College life. Let's talk about college life according to the book. This book keeps it real people. Jeering from everyone who isn't a Freshman, hard classes that you need to attend among all the temptations like parties, alcohol, beer bongs, hangovers, roommates and their sexcapades, pizza, Cup O' Noodles, cramming for exams, Z-Paks, cleaning your sheets, laundry, going home for the holidays and more. I have a niece heading to college this year and I think she will find this book funny and embarrassing. I can't wait to give it to her.